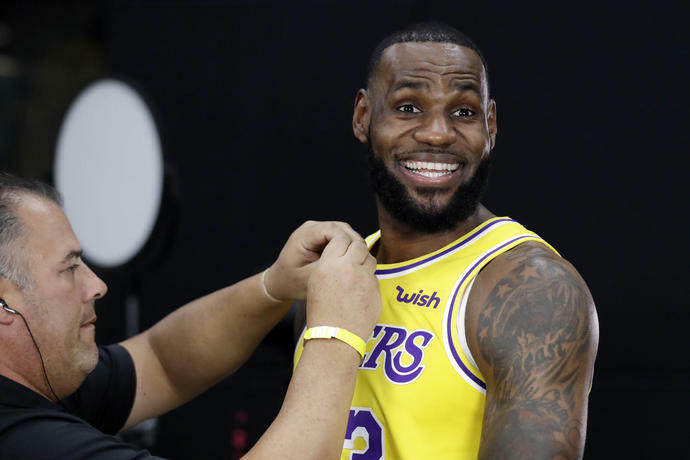 LOS ANGELES (AP) - When LeBron James chose the Los Angeles Lakers, the burgeoning entertainment mogul realized many people would think he joined a mediocre team with a five-year playoff drought because he wanted to be in Hollywood. James simply scoffs at the notion he's thinking about anything but his day job as he begins the next chapter in one of the greatest careers in NBA history. "My decision was based solely on my family and the Lakers," James explained before his first full practice in purple and gold. "I'm a basketball player. I play ball. That's what I do. When I do it at the level I do, everything else will take care of itself. As far as my business, those things have been taking care of themselves way before I even came out here." After winning three championship rings while leading - and sometimes carrying - his last eight consecutive teams in Miami and Cleveland to the NBA Finals, the 33-year-old James' new business is restoring a fraction of the Lakers' traditional glory following the longest postseason absence in franchise history. Two years after Kobe Bryant's retirement tour mercifully ended, the Lakers are relevant again. The courtside celebrities and worldwide fans whose interested waned during this dour half-decade are back in force to see what LeBron can do in this unusual, intriguing situation. The four-time league MVP brought along a contingent of NBA veterans: Rajon Rondo, JaVale McGee, Lance Stephenson and Michael Beasley. They're joining a young Lakers core with undeniable talent - Brandon Ingram, Lonzo Ball, Kyle Kuzma, Josh Hart and rookie Moe Wagner - but zero NBA success. James' teammates and coaches say he has arrived with the gravity of a champion, but with none of the imperious attitude that could accompany a player of his accomplishments. He accepts his role as a leader, but he's focused on making sure the Lakers feel like a team, not a bunch of players in orbit around him. James also realizes this particular Hollywood project is even bigger than him: The Lakers have made no secret of their plan to entice a second superstar, likely younger than James, to join them in free agency or by other means. The upcoming season is a showcase of this team's long-term potential with the right addition next summer. "Winning makes it more fun, but we haven't won anything yet," coach Luke Walton said. "We come into practice and it isn't loosey-goosey because we're expecting to win games. We're coming into practice knowing that if we want to win games, we have to do things a certain way. Hopefully when we get to games, that leads to us winning, and that would be fun. But we're not there yet." Rondo is eager to be a mentor to Ball, the Lakers' gifted second-year point guard. They're watching film and studying together as Rondo attempts to share the roots of his tenacity and the fruit of his experience. Ball hasn't participated much in camp while he recovers from knee surgery, but once the youngster is fully healthy, their partnership will be fascinating to watch. Speaking of point guard skills, the Lakers have a wealth of ball-handlers at nearly every position. After James was often forced to do it all on offense in Cleveland, almost anybody on the floor for these Lakers could bring the ball up, run the break or create offense off the dribble. Walton envisions an up-tempo, free-flowing offense mixing concepts from Golden State and Boston. At the very least, James should be spared some of the heavy work after 15 mostly lengthy NBA seasons. The Lakers' transition from a full-scale rebuilding project to a potential playoff contender has changed the tone of the franchise, particularly in practice. Walton still spends ample time educating his younger players on the fundamental aspects of his scheme, but the Lakers' veteran leadership is accelerating the youngsters' growth, Walton said. "(The young players) are a big part of our future here, so it's important that we still develop them," Walton said. "It's just a different style of developing now. It's not letting them play 35 minutes and letting them learn from their mistakes, play through situations. Now it's, 'Look, this is what we're doing,' and if we're not doing it right, we've got a lot of guys on this team where you can come out and watch other people do it. We're getting to the same point, just teaching it with different lessons." After the Lakers open the season in Portland on Oct. 18, James will make his Lakers home debut against the mighty Rockets on Saturday, Oct. 20. Staples Center courtside tickets are going for five-figure markups on secondary reselling sites, and no seat in the building is available for under $200. 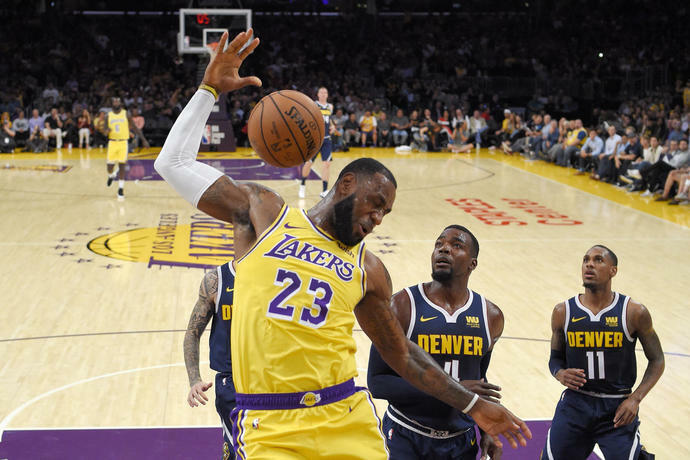 The Lakers' vast popularity in LA waned only slightly during their recent struggles, and the Lakers are once again the hottest sports ticket in LA, even with the Dodgers in the playoffs and the NFL's Rams rolling through a perfect start to the season.